Ever have something you really want to do but just don't stop long enough to make it happen? It is a classic state of affairs with me. Somehow there is always too much to do to take the time out for such frivolity. Of course I know it isn't unimportant to explore these types of interest. But to actually take the initiative and carve out a piece of the calendar was a big challenge for me. I'm happy to say though --after more years than I care to admit of wishing/wanting to... I am finally taking an oil painting class. A few weeks ago I remembered to take my camera with me. The above photo is the "classroom"- it is actually in my teacher's home. As you can see the easels (only 6 in a class) are set-up along a wall of windows which overlooks the teacher's lovely tropical garden and canal water way which leads out to a fresh water lake. Sitting by the window I am often distracted by the wildlife of geese, herons, ducks and egrets making use of the canal. Painting has become as therapeutic for me as gardening. For my first canvas (surprise-surprise)I chose to replicate a photograph of my own garden. The two and a half hours of class flies by ... before I know it the time has come and gone. 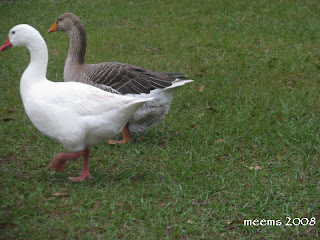 Pulling into the driveway for class today I had to wait for this happy group of Snow Geese to waddle out of the way. 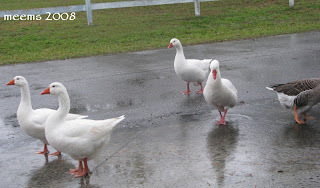 They were reveling in the sprinkles of some much needed rain we are receiving. You're doing something I would love to do! I actually have the paint and canvas, but haven't gotten brave enough to mess around with it. Maybe this weekend. I love your pictures on your sidebar. I've been to several of them, as you know. We always went to Holmes Beach on Anna Maria Island, but we have walked Coquina Beach, too. Across the road from Coquina are some trails and we did some geocaching there. That was pretty fun. Ah, I wish we were going to Florida this year!! My aunt and uncle are down there until May, so maybe if someone buys me a ticket... HA! Good for you, Meems. I have no patience for oil and paint with acrylics which can be used to achieve the same effect-they just dry immediately and if you make a mistake you just paint over it. Like Kylee, I would love to try this but like you, never am able to make the time. 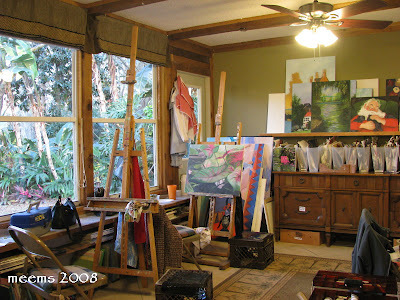 It sounds so enjoyable, but are you never tempted to grab a camera as you look out the window of her studio? Do you need to maintain a mental flow to 'see' what the canvas needs? Maybe someday I will give it a try. How wonderful to finally take a class! I am doing the same myself--an online botanical drawing class. I have never before drawn anything but stick figures so I'm learning quite a lot. Did you paint those caladiums?! Amazing first project! Is there no end to your list of talents? kylee: I give you the thumbs up to get brave... I warn you though it is most relaxing! Thanks... I'm glad you like the sidebar. Florida is a special place to me. Holmes Beach and Anna Maria are wonderful - great food and shops too. You don't really need a ticket do you? It is a fairly straight shot for you to drive and once you got here it promises to cure all your winter woes! carolyn: I really debated about using acrylics for the reasons you mentioned but I guess I went for (water-based) oils because it was what I had envisioned for so long. There are some great "fixing" tips with oils too... thank goodness! Frances: I think I'm getting to that "season" in life when I just want to make certain I explore some of the things I've held in my heart for a long time. SO... I'm "learning" to take the time... finally. I hope you will give it try someday! Yes, I am tempted and I started taking my camera to class with me but since I am inside and the birds are outside I just look up from what I'm doing and take in the moment. It actually adds to the flow to look up from the canvas and see the view whether it be a soaring egret or heron or that flock of snow geese floating in swan-like form out to the lake. Robin: So glad you stopped by... I have taken a peek at your blog and I will be back to spend some more time. How fun for you to take an on-line class and learning new things is so invigorating. I am learning so much as well since the only thing I've ever painted are walls and furniture... quite different on a canvas. sophie: You've got a quick eye. I did choose to paint my beloved caladiums and I am having the time of my life doing it... with lots of instruction. How exciting. I've always wanted to do that. Do post a picture of your painting when it is finished. Isn't that just like a man?! Duller keeps asking the same question. LOL! sophie: it must be a "man" thing... always the bottom line LOL. Oh Meems your Caladiums look gorgeous. You should share more of your paintings with us. I took a watercolor class a couple of years ago. I am so happy that I did. I learned so much. Now I am mushing along on my own. I am trying an online daily prompt from a drawing group. I hope to improve by being expected to do something daily. Drawing or painting daily is the best thing one can do to improve. I have watched several art blogs and have seen improvement amongst those that post daily or almost daily. So I have incentive. Good for you for taking your class. You don't want to grow older saying "I should have.."
Lisa, Thanks for the kind words. I only just started taking classes in November. I just get lost in painting. It is as if I am in another world with no time, no pressure. I don't feel very confident on my own yet so I really look forward to the class time. I'm glad you are practicing every day- you will surely keep improving with that motivation.